KB Home / SimpleStep® / How do I create a tax return? How do I create a tax return? You can use TaxCalc to produce tax returns for years dating back to 2011–12 for Income Tax and to 2006–07 for Corporation Tax. How do I import a TaxCalc tax return? How do I create a new client? If you've already set up a client, you can continue through the following steps. 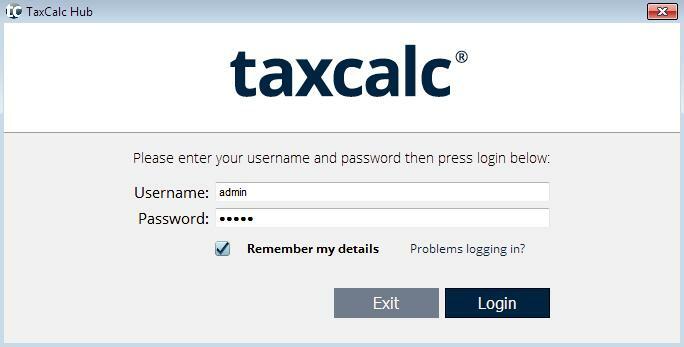 Open TaxCalc and log in as admin user. When TaxCalc opens, launch Client Hub from the home screen. The Clients screen will open. Click on the relevant client to select it. If you double click by accident you'll open the detailed record in the database. Click on the cross on the tab to close it (just like a web browser). 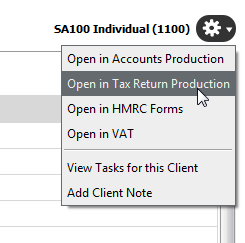 With the client selected, select Open in Tax Return Production from the left-hand menu. A Select Tax Return window will open. A Create New Individual Tax Return window will open. Select SA100 - Individual Tax Return or R40 - Individual Repayment from the first drop-down menu. Select the tax year from the second drop-down menu. You can bring forward information from the previous year's tax return, if it is listed. The Select Tax Return window will open again, listing the tax return you've just created. Click on the tax return to select it, then click on Open. You can also open it by double-clicking. When TaxCalc opens, launch Tax Return Production​ from the home screen. An Open Client Tax Return window will appear. Click on a client from the list to select it and click on Continue. A Select Tax Return window will open, listing the tax returns that have been created for this client. Create a new tax return by following step 4 above. When you're looking at a client record, you'll see an action button towards the top right of most windows. This is the icon that looks like a cog. Click on the cog and select Open in Tax Return Production.